Bundaberg’s Rotary Lodge is ready to move into its next phase. 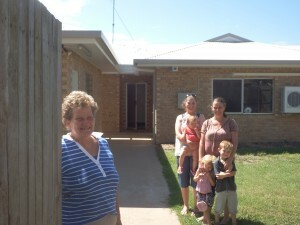 Denise Marshall and family members are pleased their donations can help in the renovations of the new Rotary Lodge. Rotary Lodge, which provides reasonably priced accommodation for patients and families visiting the Bundaberg Base Hospital, has been a reality for three years now, with the Bundaberg Health Services Foundation leasing a premises at 116 Woongarra Street at a cost of $33,700 a year – an expenditure which has only been possible thanks to regular fundraising from the North Burnett and Bundaberg communities. “We’re pleased to announce that discussions with the Wide Bay Hospital and Health Services (HHS) about viable options within the hospital campus has resulted in a house, at 277 Bourbong Street, being offered to the Foundation for patient accommodation. “The HHS has agreed to a nominal lease amount of only $6500 per annum to cover asset maintenance costings,’’ Ms Burnet said. Modifications are required to this new building to make it suitable to support accommodation and meet building compliance with Class 1b of the Building Code of Australia. Rotary Clubs are once again lending their support to ensure this work is carried out, however it also needs community support from both the North Burnett and Bundaberg communities. A working party committee has been formed and chair Ian Mylrea said that our communities have always rallied for others in times of need and this project will be a great way to show how we can pitch together for a greater aim. “We are hopeful that community groups in the North Burnett will fundraise and donate funds to ensure the project is completed in a timely manner,’’ he said. Costs for modifications could be achievable with Foundation funds, community/Rotarian support and a specifically established Morrison Marshall Fund (donations from a deceased gentleman’s family in Biggenden) who wanted to see Rotary Lodge continue as a viable option. WideBayHospital and Health Service Chief Executive Adrian Pennington said we are proud of the continued work of the Bundaberg Health Services Foundation and Rotary driven community efforts that support Rotary Lodge. “The support the Lodge provides to patients and the families who have to travel to Bundaberg for treatment is invaluable,’’ he said. This entry was posted on Wednesday, March 19th, 2014 at 6:07 am	and is filed under Rotary Lodge News. You can follow any responses to this entry through the RSS 2.0 feed. Both comments and pings are currently closed.